What does it take to be considered organized? Do you need to have a kanban board wherever you go? Or is it enough to make your bed, and scrape out time for pursuing hobbies? In this article, we’ll try to find the best organizational skills definition, show you why organizational skills are so important at work, and how to put them on your resume. You’ll find a list of inspiring resources to help you improve your organizational skills as well. The best organizational skills definition. What organizational skills to put on your resume. Examples of organizational skills that every employer values. How to improve organizational skills. Organizational skills are some of the key and transferable skills an employee can have. They refer to your ability to stay focused on different tasks and effectively use such resources as time, energy, strength, mental capacity, physical space, or others in order to achieve the desired outcome. The breadth of the organizational skills definition leads to a certain paradox. On the one hand, they’re extremely desirable by employers of all kinds. Who wouldn’t want their employees to be effective and efficient? It’s hellaciously hard to put a finger on what exactly they are. Is it enough to keep your workspace nice and clean, have a to-do list, and stick to deadlines to be called organized? Before we take a look at some examples of organizational skills, let’s get one thing straight. Well, we have a whole article explaining what transferable skills are. If you’re a well-organized person, you will remain well-organized regardless of the job you’ll be doing. Let’s break this down, and answer the question: Why are organizational skills important? They turn you into an efficient and effective employee. And this is exactly why employers value strong organizational skills so much. Your success may depend on how effectively you can organize your collaboration with others. Plus, it’s just as vital to identify who to collaborate with and on what projects. Disorganized and hectic communication will damage your productivity. You must speak and write in a clear and coherent manner to have 100% certainty that your message is well understood. Learn about some of the best communication skills for the workplace. Organizing work in a group of people is just as essential as selecting the right people to build a team in the first place. If your organizational skills are up to snuff, you’ll be able to put together a team of exceptional talents and achieve synergistic results. In fact, your delegation skills are related to your teamwork skills. Well-organized individuals know what they can do themselves, and what they need to delegate to other team members to achieve the best results. We can easily say that the most important part of a well-organized undertaking happens before anything else even takes place. The ability to plan is arguably the most important attribute of any person who claims to have strong organizational skills. Being able to give priority to your tasks is far more important than checking off items on your to-do lists. If you can identify roadblocks ahead, break complex projects into smaller components and assess their impact on the outcome, you’re on a good way to becoming an organizational guru. An extremely important organizational skill. An uberskill, if you like. The ability to perform your tasks in a timely manner, schedule, and stick to deadlines is the Holy Grail of strong organizational skills. If you can keep yourself and your team disciplined, your organization will benefit from you in each and every way. Even if you happen to be the best-organized person in the world, no one's gonna believe you. On your resume, organizational skills can show through in at least a couple of ways. Some more, some less obvious. Before any recruiter reads a single word on your resume, they'll cast a perfunctory glance at the document. A fraction of a second is enough to form a first impression. So make sure your resume is well-organized and grabs the recruiter's attention for a longer while. Go for the reverse-chronological resume format. It brings your experience and key achievements to the front. If you're a career changer or you're writing your first resume, read our guide on how to choose resume format. Choose simple and readable fonts. They don't just look good but are compliant with the ATS software. Write simple headings. They'll help the recruiter identify different resume sections quickly. Put white space to good use and avoid clutter on your resume. You want to come across as organized. Clutter is your enemy. Be concise. If you can fit your resume on a single page, do it. You may want to experiment with font sizes, numbers of columns, etc. Our resume builder makes it really easy. Begin your resume with a summary or career objective. Read our guide on how to write a resume summary, or how to write a resume objective. Then add experience and education. Learn how to describe your work experience on a resume and how to nail the education section. Include a key skills section to make sure they really stand out. 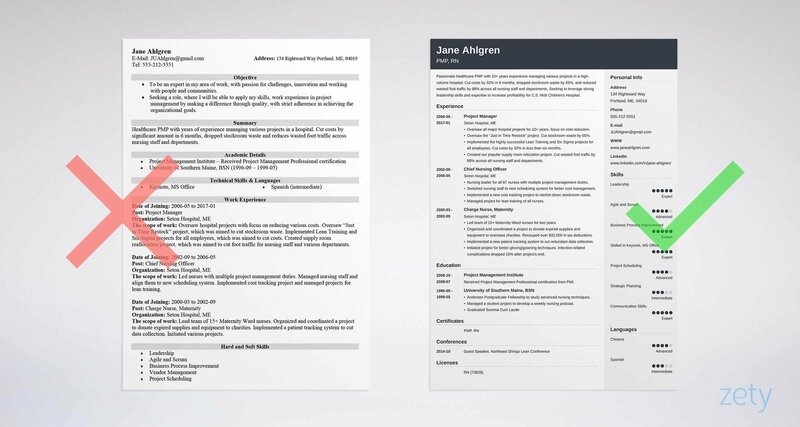 A well-organized resume layout will serve as hard evidence of your organizational skills. In resume writing, there's only one rule. That's why it's not enough to pick the best template for your resume. You must identify the organizational skills the employer is looking for, and show them you've got what they need. Start by looking at the job offer. This job description comes from a listing for the position of an administrative assistant who must have excellent organizational skills. All the planning and organizational skills that the employer requires are highlighted in yellow. The trick is to prepare the experience section of your resume on the basis of the job posting. Managed a busy 50+ employee office. Devised and implemented a tracking system that inventoried and kept track of routine supplies. Reviewed 100+ invoices and packing slips weekly to ensure all shipments are correct. Scheduled 10+ conference rooms, organized meetings and company events. Introduced a shared calendar system to coordinate office logistics. It targets relevant organizational skills, specified by the employer. It describes your organizational skills in terms of achievements. It is ATS friendly because it uses the phrasing from the job ad. We can still take it a step further. To give more prominence to these organizational skills, put them in a separate key skills section. This way they’ll not just truly stand out on your resume, but will be entirely justified by what you’ve put in the experience sections. By laying out your resume in a well-organized and easily-navigable manner. By identifying the organizational skills the employer listed in the job ad, and working them into your resume job description. By giving them extra prominence in the key skills section. You need to be ready to answer interview question about your organizational skills. Well, you’re in for a pleasant surprise. But before I tell you what exactly to expect and how to nail your answers, let’s take a closer look at a certain interviewing technique. Have you heard of the so-called behavioral interview questions? These are questions that refer to particular situations from your past work experience and whose aim is to learn how you coped with or behaved in that situation. Tell me about a time when you were involved in a stressful situation at work and how you handled it. Tell me about a situation when you succeeded in achieving a goal. Give me an example of a goal you failed to achieve. You describe a situation where you were given a particular task related to the interviewer’s question. Then you explain the actions you undertook to cope with the task and discuss the results of your actions. The interview questions to assess your organizational skills will be based on your resume. You’ll know exactly what to expect. Since your resume highlights your planning skills and attention to detail among others, well, expect the recruiter to be interested in these organizational skills in particular. The only thing you need to do is to connect these skills to the achievements in your job description and structure your answer according to the STAR method. Your answer could recount how your attention to detail and strong focus helped you review 100+ invoices and packing slips weekly to make sure all shipments are correct. You can detail your process and tell the recruiter what steps you take to do the task efficiently. Maybe there was a moment when this task was particularly difficult to complete? How did you manage to get things right? If you failed, what did you learn? As to your planning skills, focus on how the introduction of a shared calendar system helped you coordinate office logistics. Tell the recruiter about the challenges you had before and how the calendar helped you deal with them. The interview questions to test your organizational skills will not be random. They will be based on your resume and the requirements for the position. They're either lying or have no clue what they’re talking about. After all, we’re not talking talents. The first step is to realize you need to develop your organizational skills. We can safely assume you’re past this stage. Tim Urban was once a self-proclaimed master procrastinator who realized that life is just too short to put things off. And came up with a brilliant way of getting organized. This short TED Lesson casts an entirely new perspective on scheduling. If you want to become the master of your time, this one is just for you. As the title suggests, David Grady will show you a couple of ways in which you can make your meetings more effective. Gina Trapani, author of “Upgrade Your Life,” will show you how to put simple to-do lists to good use to take better control of your time. As a Product Designer, Paolo Cardini must work effectively and efficiently. In his talk, Paolo questions the value of multitasking, to encourage monotasking, that is doing one thing at a time. This book is not just about improving high school students’ time management and organizational skills, it’s for their parents as well. This classic book by David Allen will help you get organized and get rid of stress. Another classic. Stephen R. Covey teaches you how to maximize your effectiveness and efficiency. Well, if you want to get a grip on yourself and make sure your organizational skills are second to none, learn how to do it from a former Navy SEAL. General McRaven's military experience can be universally applied to a lot of non-military contexts. Your organizational skills help you stay effective and efficient—both professionally and personally. Organizational skills are among the most desired skill sets by the employers. You can display your organizational skills on your resume in many different ways. If you get your resume right, you can easily prepare for your organizational skills interview questions and answers. There are many resources (online, books, apps, etc.) that can help you improve your organizational skills. Do you have any questions about organizational skills? Maybe you’d like to share some tips on developing organizational skills? Give us a shout out in the comments below! We’d love to hear from you!